Hundreds of people got the chance to step back in time as Shire Hall Historic Courthouse Museum opened its doors to the public in Dorchester on 1 May. Dorchester’s newest attraction, Shire Hall Historic Courthouse Museum opened to the public on 1 May and a queue of people formed outside ahead of the 10am opening as people tried to be first through the door to claim a year’s worth of free coffee. The next 99 people were also given a free coffee to enjoy at the museum’s new café, which is run by Kingston Maurward College, Dorchester. The café is free to visit, as is the new gift shop. 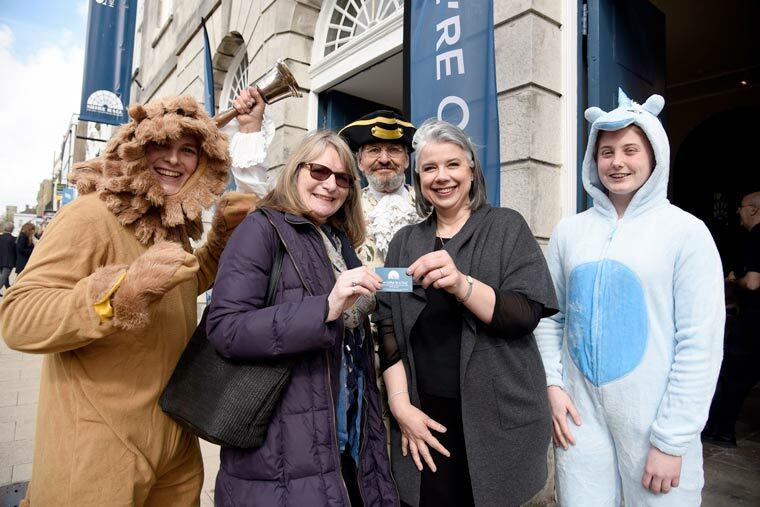 Gail Aldwin, aged 56, from Dorchester, was the lucky person to receive a year of free coffee. She waited from 7am on a chair outside in the sunshine. A crime author, she will be giving crime writing workshops in the autumn at Shire Hall. She said: “I live on Glyde Path Road and I’m a writer so I thought it would be a unique experience to come down and watch the world go by for a couple of hours. I think it’s really exciting. The new immersive museum celebrates social justice and looks at the history of protest both in Dorset and in the wider world. Its restoration was made possible thanks to a £1.5m grant from the Heritage Lottery Fund, which was match-funded by West Dorset District Council. The museum is a registered charity run by the Shire Hall Trust. One of the first exhibitions will be about protest, including the US Civil Rights Movement and Dorset’s history of protest. The local history part was researched and designed by young people in Dorset, working with Shire Hall staff and the Dorset History Centre. The museum opened on International Workers Day – very apt considering the Tolpuddle Martyrs were tried and sentenced there – the outcry it sparked jumpstarting what would become the modern trade union movement. The museum is open every day from 10am to 5pm. Entry is £8.50 for adults, £4.50 for children and £20 for a family, this includes an annual season ticket giving visitors unlimited free returns for a year. For more information visit www.shirehalldorset.org, find the team on Facebook @DorsetShireHall, Instagram @shire_hall_dorset and on Twitter @ShireHallDorset.